Lenovo has cracked the US$800 price barrier on ultrabooks, launching thin-and-light IdeaPad U-series laptops with Intel's latest Core processors starting at $749. The new models include the IdeaPad U310, which has a 13.3-inch screen, and the U410, with a 14-inch screen. Processor options for the new ultrabooks include Intel's new Core i3 and i7 processors code-named Ivy Bridge, which will provide longer battery life while making the laptops faster. The U310 starts at $749 and offers up to seven hours of battery life. The ultrabook is 18mm thick and weighs just 1.7 kilograms. The ultrabook supports up to 4GB DDR3 of memory and up to 500GB hard-drive storage. The U410 starts at $799 and offers up to nine hours of battery life. It supports up to 1TB of storage and 8GB of hard drive storage. Nvidia's GeForce graphics card is available as an option for high-end gaming. The ultrabook weighs 1.8 kilograms and is 21mm thick. Ultrabooks are designed to merge tablet features with thin laptop design and include long battery life and always-on connectivity. Lenovo's new ultrabooks can connect to the Internet when in sleep mode to update e-mail, social network feeds and other real-time activities. 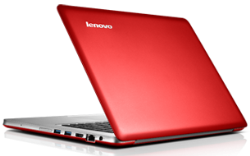 The ultrabooks resume from sleep mode in around 1 second, Lenovo said. Lenovo already offers ultrabooks like the IdeaPad U300S, but with older Core processors code-named Sandy Bridge. The new Core processors code-named Ivy Bridge will be faster and provide longer battery life. The new chips double the graphics performance over their predecessors, and CPU improvement has been measured by PC makers at between 20 percent and 30 percent. The IdeaPads also have antitheft features that let users remotely shut down their PCs in case of theft. Also included in the ultrabooks are USB 3.0 ports, webcams and HDMI (high-definition multimedia interface) ports to hook up the ultrabooks to high-definition TVs. Otherwise, users will be able to stream video directly to TVs through a feature called Intel Wi-Di. Ultrabooks were widely priced over $800, which some felt were expensive. But the market for ultrabooks is still nascent and prices will come down even further over time, said Peter Hortensius, senior vice president of the product group at Lenovo. Intel, which is the biggest backer of ultrabooks, has promised prices would fall to $699 by the end of the year. Intel expects about 110 ultrabooks to ship with Ivy Bridge processors, including 30 models with touchscreens. Top PC makers Hewlett-Packard, Dell and Acer have already announced ultrabooks with Ivy Bridge chips. Intel on Tuesday will shed more light on the new Ivy Bridge ultrabook processors at the Computex trade show in Taipei, open through the week. The new IdeaPads will become available in many countries through the company's website, and through retailers in countries including the U.S., UK, Germany, Russia, India, China, and Japan later this month.